One customer installed Vespel® CR-6100 wear rings, throat bushings, and pressure reducing bushings in two multistage gasoline shipping pumps. This conversion resulted in a 7% efficiency gain and a 90% reduction of overall vibration levels. The pumps have been in service over four years without failure, where the previous MTBR was 12 months. Pump suppliers and reliability engineers who maintain equipment in aggressive chemical, extreme temperature and critical downhole applications rely on Fluid Seals to find the best seal promptly and at the best price. Because Vespel CR-6100 is nonmetallic, has a low coefficient of friction, and excellent dimensional stability, it can withstand short duration off-design conditions such as start-up, slow-rolling, low-flow, cavitation, or run-dry situations. The pump remains available for service, resulting in potentially lower repair cost. With these characteristics, clearance at wear components can be reduced. This results in efficiency gains which lead to significant operating cost reductions, particularly when applied to populations of pumps. 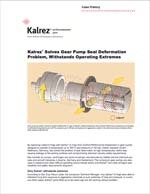 Pumps with reduced clearance also exhibit lower vibration levels and reduced cavitation. Seals and bearings last longer, and MTBR increases. 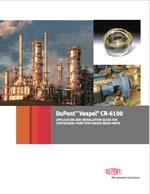 DuPont™ Vespel® CR-6100 is used for I.D.-mounted (in compression) wear components in nearly all centrifugal pump types in non-abrasive process services up to 500°F (260°C). The durability of Vespel® CR-6100 aids installation and machining, and stays tough during operation. 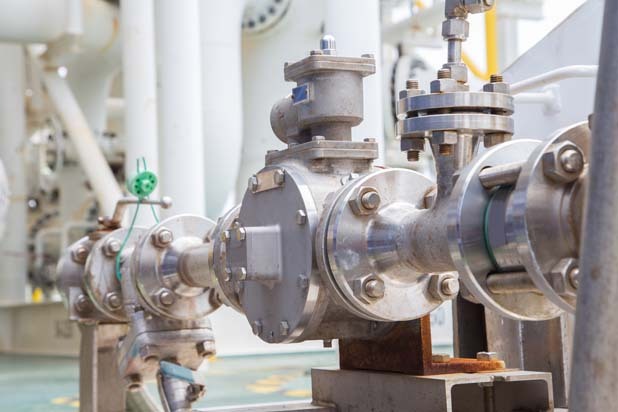 Vespel® CR-6100 wear components have been successfully used in thousands of centrifugal pumps in major refineries, chemical plants, power plants, pipeline terminals, and municipal water utilities.